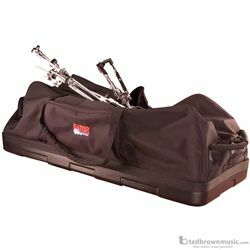 Drum Hardware Bag 18" x 46" with Wheels & Molded Reinforced bottom. Durable 600-Denier nylon construction with #10 zippers. Reinforced carry handles, synthetic fur-lined interior. Wheels and tow handle with solid bottom for support.